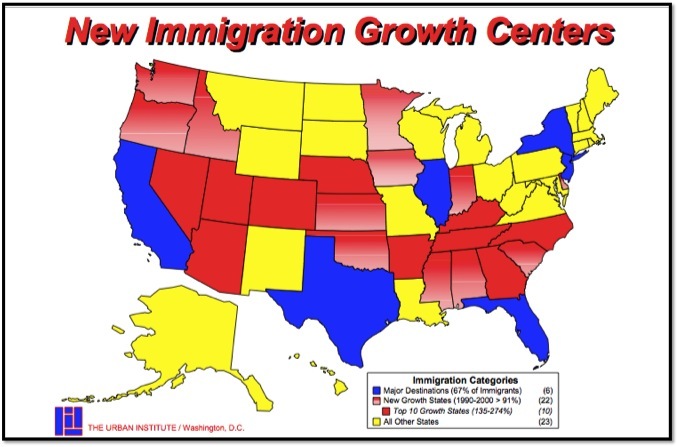 The states with the highest growth in the Latino population over the last decade are in the South, which is also absorbing an influx of people of all races moving in from other parts of the country. As would be expect from the map above, seven of the ten highest growth states for English Language are located in a red swath across the South (unsure why Ohio’s number is so inflated in the CCD data). Vasquez Heilig, J,. Lopez, F., & Torre, D. (in press). Examining teacher quality, educational policy and English Learners in Latina/o growth states. In S. Horsford and C. Wilson (Eds. ), A nation of students at risk: Advancing equity and achievement in America’s diversifying schools. New York: Routledge. Over the past several decades the United States has witnessed a dramatic growth of culturally and linguistically diverse students (e.g., García & Frede, 2010). From 1980 to 2011, the percentage of students speaking a language other than English at home has doubled from 10 to 20% (U.S. Department of Education, 2010). As the English learner (EL) population has grown, the gap between their academic achievement and that of their English proficient peers remains stubbornly static across numerous indicators including achievement scores (NCES, 2010) and high school completion rates (NCELA, 2011). Extant policies (López, McEneaney, Nieswandt, & Geronime, 2012) and teacher preparation programs (e.g., Darling-Hammond, 2010) alike are failing to address the pressing need to ensure equitable educational opportunities for ELs. Namely, “policy initiatives or legislative mandates” that constrain or forbid bilingual programs, “inadequate resources,” and a lack of “institutional will” (Garcia, Jensen, & Scribner, 2009, p. 12) are obstacles preventing educators from entering the classroom adequately prepared to meet the needs of ELs. For example, ELs continue to be disproportionately taught by less qualified teachers then their English-speaking peers (Ballantyne, Sanderman, & Levy, 2008; Darling-Hammond, 2010). The change in demographics is not only happening in the South, but also Oregon… yes. Oregon. The increase in Latino populations throughout many U.S. communities in the past two decades may be old news. But in states like Oregon, the change is very recent and very dramatic. Producer Dmae Roberts brings us a portrait of a town transformed in the Beaver state. Woodburn is now 60% Latino, the highest proportion in the state. Oregon education officials and educators are pivoting to address these rapidly changing demographics. 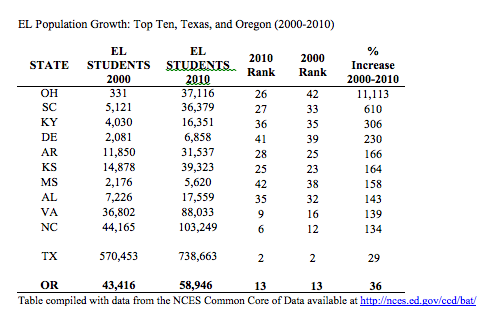 In fact, the growth of English Learner students in Oregon schools was greater between the 2000 and 2010 Census counts than Texas (36% growth versus 29%), a traditional destination for English Learner students. It was in this context that I was hired as a keynote speaker for the 39th Annual Conference set June 19-21 in Seaside, Oregon of the Confederation of Oregon School Administrators. You can view my public Prezi of the Keynote here. 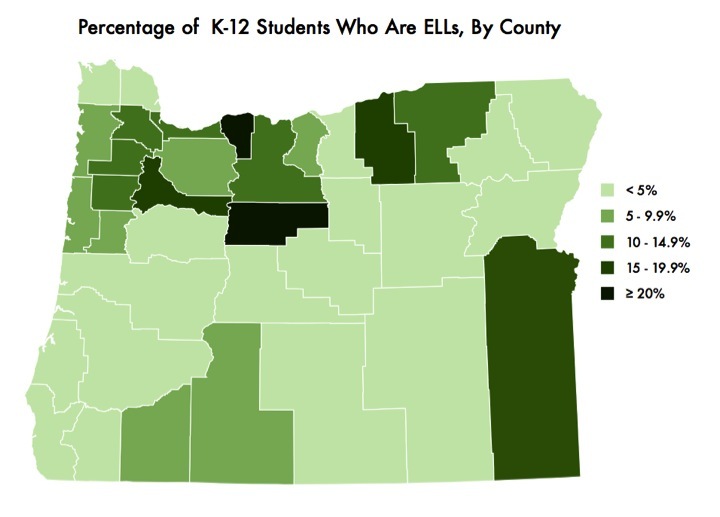 This presentation was of course designed with Oregon data in mind, but can be tailored for your district or association to discuss closing the achievement gap for EL students via the transformational power of policy, access, and equality. The Prezi is based on the new book chapter examining teacher quality for ELs in growth states discussed above, Understanding the interaction between high-stakes graduation tests and English language learners and Community-Based Accountability. For the U.S. to remain a global competitor, we must remake our educational policy based on empiricism rather than “gut feelings”— rethink the arguments underlying high-stakes testing and accountability— our nation’s rapid demographic changes require this. Our communities, our parents, our educators, our ELs, must be seen as the solution rather than the problem. I see Florida was not included in the the study’s statistics. Any particular reason? Not enough Latinos/Hispanics in Florida back in 2010 compared to the other states? Just curious. We were focusing on states with the most growth. California, Texas, Florida, and New York have the largest total numbers of Els, but surprisingly other states have had the largest growth between the 2000 and 2010 census counts. Makes sense. But now in 2014 things might be different. There is a new diaspora from PR that is coming to Florida. We’ll see.